Like many people, I spend quite a bit of time each day sitting at the computer. When I'm not working on my novel or client projects, I am often playing video games on my PC. While I love my job and my hobbies, the only thing I don't like is the pain I get for spending 10 or more hours at a keyboard. By the end of the day my finger feel sore. I have tried a variety of stress balls and other products over the years, and found that most of the product on the market to help typists just don't work for me. Recently, however, I found out about a new product that seemed like it was made for someone like me – Yoga Hands. When I reached out to them to ask if I could review their product, they were happy to send a set out to me to try out for myself and review for you! So, the entire concept behind Yoga Hands is that these hand stretchers help ease the pain for anyone who do small, repetitive motions throughout the day. As anyone who types or sews knows, doing the same thing over and over can over time lead to pain. While many of us know this is the case for athletes, we rarely think about it affecting the everyday person who goes to work and types for six to eight hours a day. Over time, this repetitive activity can lead to carpal tunnel, arthritis, hand fatigue, and muscle cramps. By using Yoga Hands to stretch the muscles in your fingers and hands, you are not only reducing hand cramps, but refreshing the muscles in your hands. In my experience, your hands feel better, and you can type longer without issues! Since these are designed to be lightweight and comfortable, you can use them wherever and whenever you like throughout the day. Best of all, they are made right here in the United States! When I first got my Yoga Hands, my first concern was that they said one size fits most. You see, my hands are actually fairly small. When working with children, I found that my hand was comparable to about a 10 or 12 year old boy. While this isn't a huge deal for me (I'm a fairly small person) – it means that I have a hard time finding gloves and such. My husband, however, is the exact opposite. He has HUGE hands and sometimes has problems finding things large enough for him. I found it very unlikely that both of us could use the Yoga Hands for this reason. Surprisingly, I was wrong. We can both use the Yoga Hands comfortably due to the thick foam sizers in the middle of the device, allowing both of us to enjoy the benefits of this device. As well, the Yoga Hands are simple to use. All you have to do is put your fingers through the wedges and pull it toward your palm. You know it's working when you feel a gentle stretch throughout your hand. You usually have to adjust the wedges a bit however to get the Yoga Hands to fit you most comfortably. I usually let my fingers stretch anywhere from two – five minutes, depending on how they were feeling, and how my deadlines are looking. One thing is for certain, it is probably one of the easiest stretching devices I have used in a very long time! So far, I couldn't be happier with the Yoga Hands. Not only has my hand pain gone down dramatically, but I can now push myself a bit longer with work. I haven't timed how much more typing time I get out of myself due to the Yoga Hands, but I know my pain has decreased. If you are someone who types quite a bit throughout the day, I don't think I can recommend these enough – I gladly give them an A+ rating! 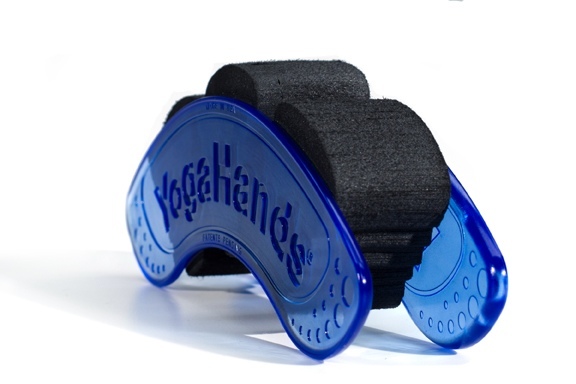 Currently, you purchase a pair of Yoga Hands from their website or at Amazon.com through their Yoga Hands product page. You can either purchase them for $39.95 from Amazon.com with free shipping or for a limited time you join the Yoga Hands mailing list to receive a 25% coupon on your entire order from the Yoga Hands store! As well, if you don't like Yoga Hands, don't worry! They have a 30 day money back guarantee! Wherever you decide to purchase these stretching tools, I think you will find that just as useful as me and find them to be a must for anyone who spends quite a bit of time at the keyboard! Yoga hands will also help with my fibromyalgia and arthritis problems. I've had a good amount of pain in my fingers after a long day at the computer – I hope this would help! I saw these and was wondering how they worked. Thanks for the review and the giveaway. I desperately need one of these for my hands. My hand is starting to hurt a lot when I type. These sound pretty interesting!! It would be nice to not have my hands hurt during yoga. I always end up with a mild case of soreness in my hands and wrist. This would help out alot. I could probably benifit from these. Spend a lot of time at the computer. I have a habit of tensing up my fingers, even when I'm finished crocheting. I think these would help me so much. 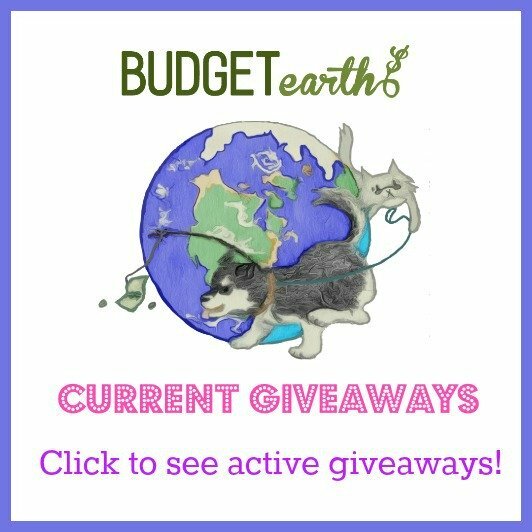 I am happy to find this giveaway! I do get pain in my hands after being on the computer all day, this looks like the perfect thing for me. I would think it would help with my hand pain after being on the computer a long time. Do you know if Yogahands helps alleviate the pain of arthritis in your hands? Thanks for your answer. I know some of my readers have had great results with it. It worked great for me when I had severe strain. I get cramps in my hands after spending too much time typing. I would love to give this a try. I look forward to trying this product, I have Fibromyalgia and have finger, hand, and wrist pain, so I’m always on the lookout for things to help me. Thanks so much! This is such a great invention, thanks for the idea and I will have to look for it! Yoga Hands look really cool! Makes me want to try yoga! This looks like something I really would like. I work full time at a computer and by nighttime my hands/fingers are really tired. Thanks. I am hoping that they will help prevent issues in my hands later, especially because a lot of my time is spent on the mouse or keyboard… so stretching them out occasionally will really help them. my hands hurt from being on the computer to much so I think the yoga hands could really help. I’m a sign language interpreter with tendinitis. Thanks for your review on this product! I may have to ask for this for Mother’s Day. I bet these would help my mother in law! Shes in so much pain! This is a good and useful product review;thanks for sharing. Huh. Who knew such a simple thing would help so much. When I first saw its picture, I thought it looked slightly amusing. I wouldn't have looked twice at it. But now I want to try it out. Thanks for the review! So glad you thought it was interesting. I had no clue how to take it when I was first asked to review it. It is now part of my normal workday with how much I type! This sounds really cool! I do get tired at the computer so this is such a great invention. Thanks for sharing! YogaHands is a therapeutic device that allows you to exercise your hands. It can relieve painful muscle strain and bring carpal tunnel relief. I’m so glad you liked the review! I use these things daily since teh yare just so helpful. I was worried for awhile that I was developing carpal tunnel due to how long I spend on a computer each day. After using these, I felt soooo much better! Awesome review and I loved the video. I love how the muscles in the fingers can be kept at a passive stretch. I could really use this as I give massages. My husband was just complaining of a sore wrist. Bet this would hlep. They are pretty amazing. I include these as a daily part of my writing routine since I spend six – ten hours a day at the computer typing, not counting playing computer games or spending time on Facebook. These really changed my quality of life! I have seen these before and didn't really get how they worked! Thanks for helping me understand. They look great! I would love to try this! It would be wonderful to be able not to have as much pain and stiffness. The thought of doing stitching and caligraphy again is exciting! Thank you for the info! Great idea and very useful and practical nowadays. We are often using our hands too much. Computers, sewing, video games, just daily work. Our hands take on a lot and we don't think to stretch or exercise them. Convenient and easy this would be nice to try. I work on the computer a lot at work then will be on it at home also – so these would really help. I also have arthritis-type effects from Lyme's disease and it affects my hands/fingers – I wonder if this might help that also versus taking meds. Thanks for the review! I find that my hand and wrists hurt more and more. This looks awesome! I never thought about that but you are right! That is a lot of repetitive movement! WOW! I have never ehard of this product before and I (and my husband) could really put it to good use. He has carpel tunnel from many years of court reporting and I love to sculpt and ….. maybe play a few games on my iPad 😉 I would share it (or buy one) for my 92 yr old Dad who has arthritis problems in his hands. Thanks for a really useful review and product introduction. I have quite a bit od pain in my hands and wrists. This looks and sounds like it would help me greatly. Thanks so much for reviewing it! I didn't know anything like this even existed. I am on my laptop A LOT and my pinky fingers tend to be the ones that get sore first. I would love to have this and see how much it will help. It looks awesome. Yoga Hands sounds like the perfect way to stretch the tired and sore fingers to help decrease pain in joints. from crocheting and playing on the computer. I think this would be great for arthritic pain also. Thank you for sharing the information about Yoga Hands with us. Thank you for the review! I like you, spend a lot of time at the computer and I crochet many hours during the day. My hands tend to want to stay in that position throughout the evening and I find myself tensing up causing the muscles in my upper arms to be sore. The Yogahands would probably be a blessing for me, I am hoping anyway. I'm glad they worked for you and your pain is diminished! I would love to use Yoga Hands to exercise my hands and fingers after long days of working on the computer. My hands tend to cramp up, maybe this will help that stop happening. They really are wonderful. Along with being and writer and blogger, I also do artwork. the thought of being in pain all the time is just too much for me! Although I don't have traditional carpal tunnel syndrome, I have a lot of finger and wrist pain and fatigue due to arthritis and too much computer work. These sound like they would be a welcome relief and an alternative therapy that's worth a try! You did a grat job on this review.This seems like sa great product for many people.i could really benefit from these because my M.S. has caused weakness in my hands. Thank you! I try hard to give thorough reviews. I really hope it works for you! These sound really great! Some of the yoga classes I go to do little stretches that they say will help with things like carpal tunnel but it would be nice to own something like this that I could do at home! I think Yoga Hands is a product that I could really benefit from. I spend a good ampount of time on my laptop and my hand and fingers very often get crampy and hurt. I think I may be getting arthritis as well because I have swelling at the knuckles of some fingers. Thanks for the review and info on Yoga Hands! I think this looks amazing… I spend most of my 12 hour work day on the computer, and anything that can help strecth my hands and fingers and give me a little relief from the cramping would be very welcome! Brilliant idea! I am typing all day and work and when I get home (after the kids are in bed), I am back on the phone….playing Candy Crush!! Yoga Hands gives you a good stretch while keeping your hands in good alignment. It looks easy to use and lightweight. I have arthritis in my right hand especially (my dominant one) and I hopr that Yoga Hands will help me. I like that it is simple to use, stretches your muscles and is made in the USA. I was suprised to see that the one size fits most really worked, I usually thing One Size Fit None. I take yoga and we do hand excercis but I don't think to do more at home when I need it, like entering giveaways. I think my mom would love these. She crochets and is almost 75 years old. She could really use something to stretch her hand muscles to help with her pain. i work at a computer all day everyday. these would really relieve some tension! I think these would would my hubby's hands. He has bad arthritis and his hands hurt after work. Would love to see if they work for him. Thanks for the chance. I have diagnosed carpal tunnel syndrome in both hands but it's worse in my right. I would LOVE to try YogaHandsvas an alternative to surgery. This is a great invention because it is hard to find exercises that specifically target the wrists.It is good to know there is an alternative to surgery for carpal tunnel. wow great review i need these so bad my hands and arm is starting to feel numb and i wonder if i am starting to get carpel tunnel i am on the computer a lot and those would help my hands so much. i definitly need to refresh and stretch my hands more and that would really help . These hand stretchers look very nice. Thanks for the interesting and informative review!